Half the fun of playing the sneaker game is building a collection. Beyond making a fashion statement and looking great on your feet, kicks are collectibles, and sneakerheads are a rabid breed of collectors. You might even say that sneakers are an extension of childhood preoccupations like trading cards and action figures—and the kid with the rarest, most unique piece rules the schoolyard. That's what makes "limited edition" sneakers special. Every collector needs a holy grail, an extremely rare, extremely coveted pair that's ultra-hard to find and cop. And while that could easily be any other shoe depending on who you're talking to, the six below are probably some of the more infamously hard-to-get kicks that deserve to be the centerpiece of any collection. Nike Dunk SB Low "eBay"
Dunk SBs are arguably the most collectible sneakers out there. A lot of their colorways come with special background stories that add a lot of value to the shoes themselves. 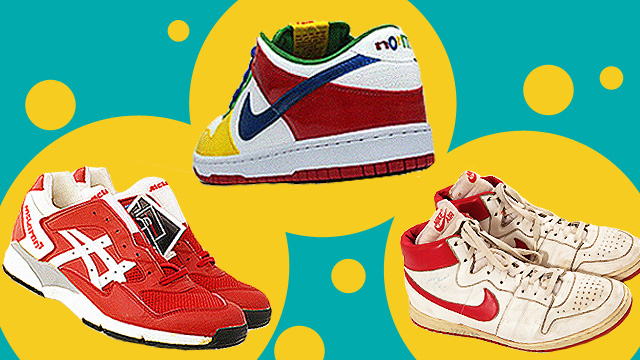 But as far as rarity goes, the eBay Dunk SBs are at the top of the list. The colorway was created for a special charity auction in 2003, and went for $30,000 (about P1.4 million) to an anonymous winner. There were only two pairs at the time: the one that was displayed at the auction, and the one that was given to the winner, in his size. The display pair was, in a WTF move, cut into pieces, to ensure that there would only truly be one pair in existence. It's that ceremonial destruction that made these Dunks incredibly popular and coveted. Jordan fanatics are among the craziest sneakerheads, and this particular colorway for the Air Jordan is among the lesser-known collectibles. While many are familiar with the Defining Moments Pack of 2006, which consists of an Air Jordan 6 and an Air Jordan 11 in black and gold, not everyone knows that some pairs of the 11s came with gold eyelets. Rumor has it that they were a factory defect, or a sample that accidentally made it into production. No one knows exactly how many pairs of these are floating around, but the gold eyelets remain an incredibly sought-after visual detail for this particular shoe. These days, fashion sneakers are all the rage and a dime a dozen. But back in 1997, it was almost unheard of for high fashion labels to collaborate with sportswear brands, much less sneaker companies. But the Instapump Fury was a design that was way ahead of its time, and Chanel was quick to recognize its potential. With a limited production run of just 150 pairs, the house of Coco partnered with Reebok to create a colorway of the Instapump Fury that remains a holy grail for Reebok collectors everywhere. What's most amazing about this pair is how it preceded (and perhaps predicted) the rise of the high fashion sneaker. Air Jordan 4 "UNDFTD" and "Eminem"
Air Jordan 4s have seen a lot of collectible colorways in their time. Chief among them—and among Jordans in general—are the "UNDFTD" 4s and the "Eminem" 4s. The former was a 2005 release, in collaboration with Los Angeles streetwear label Undefeated, and a military-inspired colorway that saw a production run of only 72 pairs. The latter is a blue colorway that came out in 2006, handed out to friends and family of Slim Shady himself in a production run of only 50 pairs. Like the Chanel Instapump Fury, these Jordans were among the first few of their kind. Today, Asics is known for its specialty collaborations with some fairly underground sneaker boutiques around the world, like KITH and Brick & Mortar. But its recent popularity belies Asics' rich history in collaboration. Back in the '90s, Asics created a special line of sneakers exclusively for McLaren's Formula One team, including the Gel McLaren MA-2 and the Gel McLaren F-1. The shoes are said to have been an exclusive release for the McLaren pit crew, so it's safe to assume that it's a small production run. These are especially novel because they may just be among the first (if not the actual first) collaboration between sneakers and motorsports. And even today, how often does that happen? How Long Should You Keep Different Kinds Of Food In The Freezer?